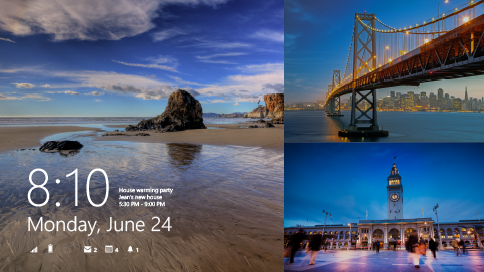 The original Windows 8.1 RTM ISO images created by Microsoft has been leaked by WZOR. Microsoft has earlier completed the development of Windows 8.1 RTM, and compiled the new version of OS at build number 8.1—9600.16384.130821-1623 on August 21st, 2013. Microsoft has also set the official general availability (GA) release date for Windows 8.1 to October 18, 2013. Unlikely prior Windows releases, this round not even the ‘privileged’ MSDN and TechNet subscribers will get the software earlier than the mass, despite Microsoft has immediately delivered Windows 8.1 to OEMs, in an obvious attempt to prevent a leak. But here comes the leak for Windows 8.1 RTM. But note that Microsoft has released more QFE (Quick Fix Engineering) updates for Windows 8.1 before GA to fix issues that are discovered after RTM, and that’s explained the gap between between RTM and GA.
Windows 8.1 packs a few new features, such as a single integrated search for documents, apps, and the web; redesigned Windows Store; more default apps such as Reading List; updates apps such as Photos app with editing capability and Mail app; Skydrive as built-in cloud storage; Internet Explorer 11; boot to desktop instead of Start and etc. For the Windows enthusiasts who can’t wait for the general availability date of Windows 8.1, various editions and languages of Windows 8.1 RTM in ISO images have been leaked, available for free download via BitTorrent network. Here’s the hash checksum information for the US English version of Windows 8.1 RTM. Magnet links for the download is available at the forum, downloadable with your favorite BT client. But these serials can’t be activated though. To activate the Windows 8.1, reenter the legitimate Windows 8 retail or OEM product key (Microsoft promises free upgrade for Windows 8 users, don’t they?) to activate the Windows 8.1. If you don’t want to go through the hassle of reactivating Windows 8.1, then it’s wise to wait for GA, that’s when new Windows 8.1 will be made available as a free update via the Windows store for the existing Windows 8 users. It’s especially true for people who hacktivate Windows 8 with Windows 8 ProWMC (Windows Media Center) upgrade key, where you need to spend more time to get the system activated. Those using MAK product key, or KMS is unable to activate for now as Windows 8.1 has updated its KMS mechanism. Windows 8.1 Update is now available.